H.G. Wells' tales of fantastical inventions, never-before-seen beings, time travel, and alien invasion practically cry out for visual and sonic accompaniment. 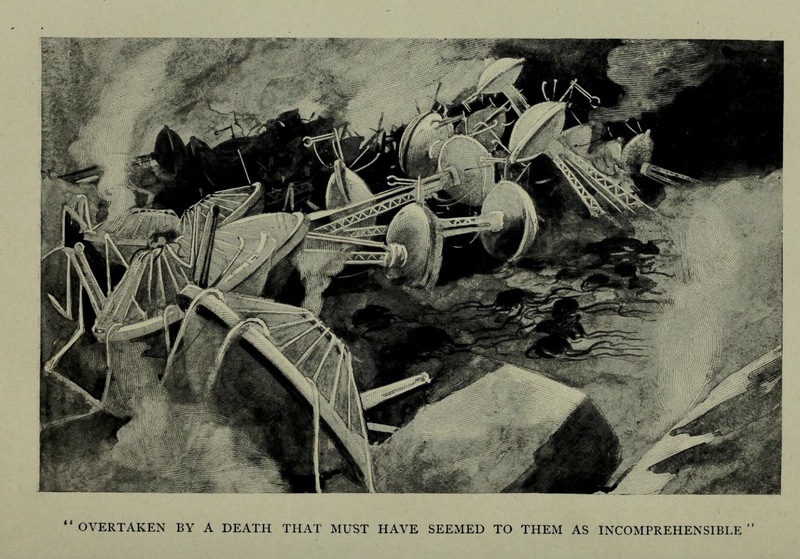 Of all the other artists' interpretations of his 1898 novel The War of the Worlds, Orson Welles' infamous Halloween 1938 radio broadcast remains best known, but various illustrators have also brought the story of mercilessly destructive Martians' arrival on Earth to equally vivid life. 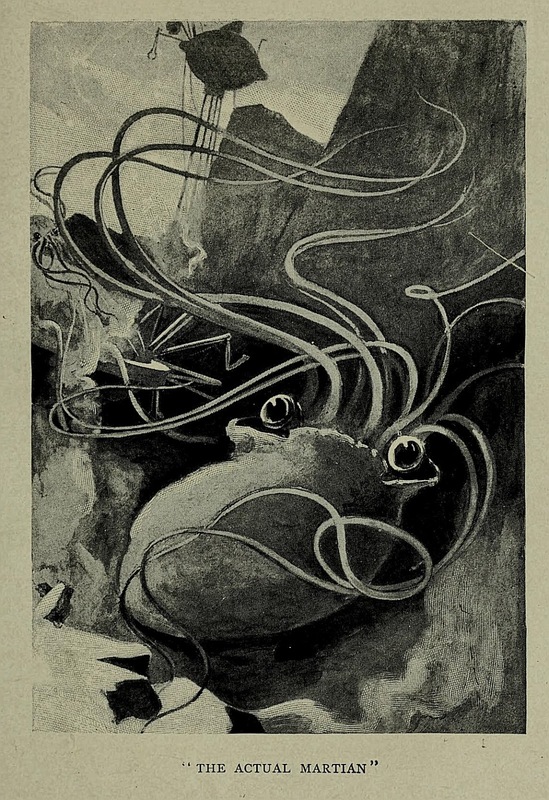 Last year, we featured Brazilian illustrator Henrique Alvim Corrêa's horrifying work for the 1906 edition; today, we go back before The War of the Worlds' first edition to behold the aliens as rendered by Warwick Goble. "I'm doing the dearest little serial for Pearson's new magazine," Wells wrote to a friend, "in which I completely wreck and sack Woking — killing my neighbours in painful and eccentric ways — then proceed via Kingston and Richmond to London, which I sack, selecting South Kensington for feats of peculiar atrocity." 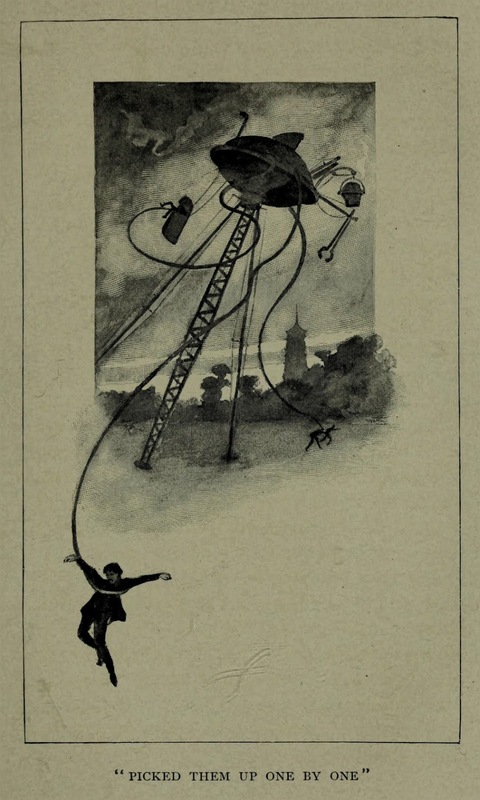 That dearest little serial, after its 1897 run in Pearson's Magazine in the U.K. and Cosmopolitan in the U.S., appeared the next year in book form as The War of the Worlds, a common publication procedure for popular English-language novels in the 19th and early 20th century. 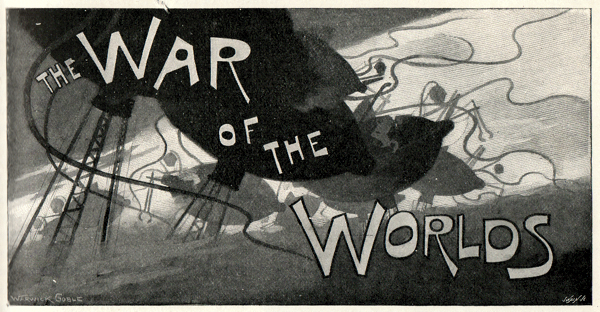 "The story is still a bit rough round the edges," writes sci-fi author John Guy Collick, but "what makes the magazine special are the fantastic illustrations by Warwick Goble. These are the first pictures of the Martians and their tripods and, I think, the best." He praises their low-tech style and their faithfulness to the text: "in the novel Wells is at pains to point out that the Martian legs are rigid," not articulated as the films and other illustrations have tended to portray them." The Martians themselves he considers a "bit too cute, though they are the first attempt to visualise beings from another world," and these depictions of terror from another planet (more of which you can see here) certainly marked a departure in Goble's children's book-oriented career. Even an artist of whimsy has to cause a few nightmares once in a while.